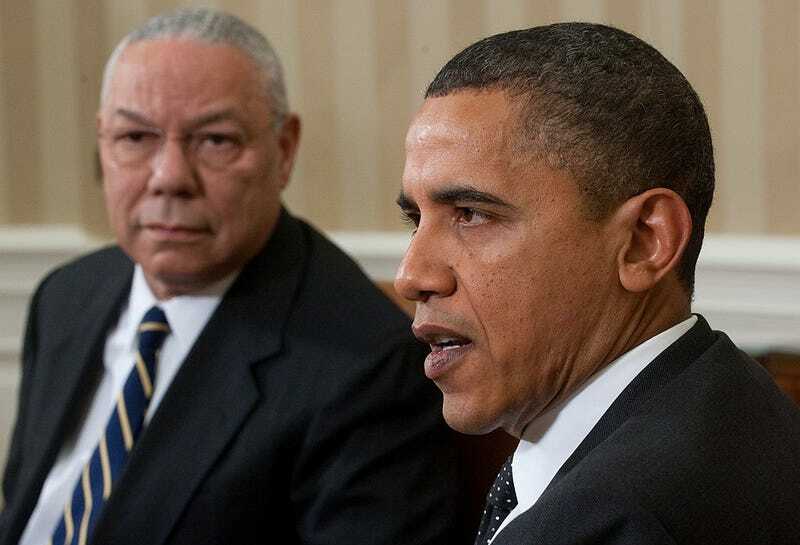 President Barack Obama (right) speaks alongside former Secretary of State Gen. Colin Powell during a meeting in the Oval Office of the White House in Washington, D.C., Dec. 1, 2010. Amid the eye-popping statements by Colin Powell revealed in hacked emails made public Tuesday was his belief, seconded this week by President Obama, that news media coverage was helping Donald J. Trump. That help was magnified when the media criticized solely on the "optics" Hillary Clinton's statement that half of Trump's supporters are bigoted, Ta-Nehisi Coates added this week. ". . . In the emails, Mr. Powell blamed the news media for helping fuel Mr. Trump’s candidacy," Michael D. Shear reported Wednesday in the New York Times. "In December 2015, he turned down a request from CNN’s Fareed Zakaria to discuss Mr. Trump. 'It is time to start ignoring him. You guys are playing his game, you are his oxygen,' Mr. Powell responded. In August 2015, Mr. Powell predicted that Mr. Trump would 'take it to the convention' in part because news networks were chasing ratings. . . ."
The same day the hacked emails surfaced, Obama vented at a campaign rally for Clinton in Philadelphia that he was "frustrated with how this campaign is covered," Oliver Darcy reported for businessinsider.com.
" 'I'm just telling the truth. Guys in the back, I'm just telling you the truth about how I feel about this," the president said, speaking directly to the members of the media toward the back of the rally. "Obama contended that Clinton and Trump were starkly different on a number of issues. It should be noted that in the hacked emails from Powell, a Republican, former secretary of state and former chairman of the Joint Chiefs of Staff, also criticized Clinton. "Everything H.R.C. touches she kind of screws up with hubris,” Powell wrote. It is also true that Obama's public statements were self-serving and that the news media have made an effort to be tougher on both candidates, even though Trump's base, in particular, appears to be impervious to facts undermining the credibility of its candidate. Still, journalists have given the issue of false equivalence — equating Clinton's shortcomings with Trump's — more attention in recent weeks. Nicholas Kristof, a New York Times columnist, expressed alarm Thursday that "A CNN/ORC poll this month found that by a margin of 15 percentage points, voters thought Donald Trump was 'more honest and trustworthy' than Hillary Clinton. Let’s be frank: This public perception is completely at odds with all evidence," Kristof wrote. Kristof added, "I wonder if journalistic efforts at fairness don’t risk normalizing Trump, without fully acknowledging what an abnormal candidate he is. . . . We should be guard dogs, not lap dogs, and when the public sees Trump as more honest than Clinton, something has gone wrong. . . ."
Ta-Nehisi Coates, the Atlantic commentator and best-selling author, expanded on the racial aspect of the discussion on Monday in discussing Clinton's comment Friday that half of Donald Trump’s supporters are motivated by some form of bigotry. “The racist, sexist, homophobic, xenophobic, Islamophobic — you name it,” Clinton said. “And unfortunately, there are people like that, and he has lifted them up.” Clinton apologized for estimating the figure at "half." Many commentators contended that Clinton had crossed a line in calling out Trump's supporters, rather than simply Trump himself. Coates wrote that that was the wrong response. "For much of this campaign journalists have attacked Hillary Clinton for being evasive and avoiding hard questioning from their ranks. And then the second Clinton is forthright and says something revealing, she is attacked — not for the substance of what she’s said — but simply for having said it. This hypocrisy carries a chilling implicit message: Lie to me. Lie to the country. Lie to everyone. This weekend was not just another misanalysis, it was a shocking betrayal of the journalistic mission which should urge the revelation of truth as opposed to the propagation of hot takes, Washington jargon, and politics-speak." He continued, "The shame reflects an ugly and lethal trend in this country’s history — an ever-present impulse to ignore and minimize racism, an aversion to calling it by its name. For nearly a century and a half, this country deluded itself into thinking that its greatest calamity, the Civil War, had nothing to do with one of its greatest sins, enslavement. "It deluded itself in this manner despite available evidence to the contrary. Lynchings, pogroms, and plunder proceeded from this fiction. Writers, journalists, and educators embroidered a national lie, and thus a safe space for the violent tempers of those who needed to be white was preserved. . . .
"The safe space for the act of being white endures today. This weekend, the media, an ostensibly great American institution, saw it challenged and — not for the first time — organized to preserve it. For speaking a truth, backed up by data, Clinton was accused of promoting bigotry. No. The true crime was endangering white consciousness. . . ."
Is Donald J. Trump a racist or simply pandering to racial fears — and does it make a difference? It does, according to Ian Haney López, a constitutional law scholar and author of three books on race, including his latest, "Dog Whistle Politics: How Coded Racial Appeals Have Reinvented Racism and Wrecked the Middle Class." López appeared on a panel Tuesday at the News Leadership Conference of the American Society of News Editors and Associated Press Media Editors in Philadelphia. He argued that Trump is the latest in a line of politicians manipulating racial fears, that candidates following his strategy are likely to harm the country for at least two decades, and that news media broaching these topics should consult people who have seriously studied racism. "It's as if we're all experts — but we're not," López said. "Racism is overwhelmingly a white phenomenon," he said at a panel titled, "Lame Ducks and Dog Whistles: Race, Precedence and the Presidency." "How does it work in regard to Latinos? In regard to Muslims? Those aren't easy questions," he said. One needs to discuss the differences in order to have "effective conversations." Many Trump supporters are afraid that their way of life is being threatened, and that's what Trump is exploiting, López said. "He is a strategic racist, someone who appeals to the worst aspect of the American electorate. . . . Mitt Romney was a strategic racist when he was tying [President] Obama to welfare." Others on the panel saw things differently. Aminda "Mindy" Marques Gonzalez, executive editor of the Miami Herald, said she did not see a difference between someone who says racist things and someone who is racist. Further, she said, "Most of us were too timid at first to call it out." However, López maintained that whether Trump is an actual racist goes to what's in his heart, which is irrelevant. "Only a minority of Trump’s supporters forthrightly embrace white superiority. In campaigning, then, Trump must carve a course between mobilizing voters with tales of racial peril and not obviously appealing to them as outright bigots. "This has always been part of the art of dog whistling, though it does force a clarification of the metaphor. Sometimes dog whistling works like a secret handshake, benign to outsiders but clearly understood by those in the know. George W. Bush practiced it this way, for instance in using terms like 'compassionate conservative' and 'faith-based initiative.' To most, these phrases seemed anodyne, yet as journalist and author Craig Unger explains, Bush intended them to signal to Christian fundamentalists his commitment to their ascendance. "But when seeking to appeal to widely condemned group animosities — such as racism, sexism, and homophobia — dog whistling works differently. The most important goal becomes to hide the full ugliness of the underlying message from the target audience itself. "So Trump must observe certain limits. . . ."
Win or lose nationally, López said, Trump will be successful in many local districts. There, admiring future candidates will mimic Trump's strategy. "We will be living with this for another two decades, at least," Lopez said. "It's like he's ripped the Band-Aid off this deep wound." Moderator Keith Woods, NPR vice president for diversity in news and operations, concluded, "Maybe for the first time in our discussion of race, everybody's in. Our challenge is now how to make journalism out of that." Henry J. Gomez, cleveland.com: Donald Trump fans have been sending me racist, hateful messages for months. Here's a sampling. Rick Sanchez, Fox News Latino: As Hillary quietly fainted, where were the big time correspondents? A diverse array of civic leaders discusses participation in the Community Civility Counts initiative. No name calling. No bullying. What a concept, especially for an entire community. A Community Civility Counts initiative sponsored by the Munster, Ind.-based Times Media Co., in which civility is promoted in the community, in the newspaper and in the classroom, won the Innovation of the Year award from the Associated Press Media Editors Tuesday at the News Leadership Conference in Philadelphia. Editors attending the conference, held by the APME and the American Society Newspaper Editors, decided among three finalists on Tuesday. “ 'This is great recognition for something that started right here in the Region,' Editor Bob Heisse said Wednesday, Kaitlin Lange of Ball State University reported. “The Gary Chamber of Commerce and The Times Media Co. partnered and rolled out Community Civility Counts, its ‘Together we Win’ slogan and #CivilityCounts hashtag. It has grown into an awareness campaign that’s gaining national and international attention for simply doing the right thing. “ 'I think we’re all tired of the name calling and bullying, and it was great to share our campaign with others,' Heisse said. A video covering campaign highlights was shown to the audience at the conference, and is attached to this story. "The Times and Gary chamber and other partners have worked over the last year on various initiatives to bring civility to the community. The Times refuses to publish vitriolic speech and does not host anonymous online comments. “ 'This is something any of you can do in your communities,' Heisse told news leaders. 'It’s a concept that our community has embraced.' . . ."
When Hollis R. Towns was awarded the 15th annual Robert G. McGruder Award for Diversity Leadership on Tuesday, one accomplishment for which Towns was cited was successfully pressing local police to release mugshots of white suspects as well as those of color. Towns is executive editor and vice president of the Asbury Park Press in Neptune, N.J., and the award was presented by the Associated Press Media Editors and the American Society of News Editors at their News Leadership conference in Philadelphia. "The nearly all-white police forces in both [Monmouth and Ocean] counties would routinely release arrest photos of minorities caught in drug stings and horrific crimes, but most often did not present photos of white suspects who posted bail or were involved in white-collar crimes. Hollis used the bully pulpit of the Press to demand that police release all suspect photos and, when there was resistance, he took the fight to the public. "If no mug shot were released, each police story would end with this phrase: 'The Press requested a photo of the suspect but police declined to provide one.' The pressure eventually convinced several police departments to change their ways. Ocean County quietly posted its mug shots on the county jail website." The newspaper noted when the award was announced in July, "Towns is being honored for championing diversity in both hiring and news coverage at the newspaper. He raised minority employment at the Press from less than 10 percent in 2008 to 25 percent in 2016. The senior management team at the newspaper is 44 percent women and 33 percent minority. . . ."
In Story of Killing by Police, How Much Is Racial? A white cop shooting and killing an unarmed black man is news. So is a white cop not shooting and killing an unarmed black man — and being fired, purportedly for not taking the black man's life. That story, based on reporting by Sean D. Hamill of the Pittsburgh Post-Gazette, went viral this week. But as Hamill told Journal-isms by telephone on Thursday, it's not at all clear how much of the story is about race. The New Pittsburgh Courier, a member of the black press, cast the tale Thursday in racial terms. "Time and time again we’ve read and reported incidents in which unarmed Black men and women were shot down by police," Charise Frazier wrote. "But this time, a West Virginia officer lost his job for not shooting a man who held an unloaded gun because he reportedly put other officers in danger. "On May 6, Officer Stephen Mader responded to a domestic disturbance call in Weirton, West Virginia. When Mader arrived on the scene, he was confronted by Ronald D. Williams Jr., a 23-year-old Black man, reports the Pittsburgh Post-Gazette. Williams’ girlfriend made the call to police. 'I saw then he had a gun, but it was not pointed at me,' Mader said, who observed Williams’ handgun was in his right hand hanging downward, pointed at the ground. "According to Mader, he used a calm voice and told Williams to lower his gun. Williams responded with, 'Just shoot me.' 'I’m not going to shoot you, brother,' Mader said back. He recalled Williams flicked his wrist to get him to react. “ 'I thought I was going to be able to talk to him and deescalate it. I knew it was a suicide-by-cop situation,' Mader told the Post-Gazette. "But all of Mader’s training couldn’t prepare him for what happened next. Shortly after, two more officers arrived on the scene. Williams walked toward the officers, waving his gun, according to the Post-Gazette. One of the officers aimed and fired at Williams, striking him dead with a shot to the back of the head [as Williams walked toward them waving his gun — later found to be unloaded.] The two responding officers were also White. "After the shooting, the Weirton Police Department engaged in a series of missteps. An investigator was brought in who promptly took a week-long vacation, and the department also refused to publicly release Williams’ name for three days. . . ."
Hamill reported Sunday, "As a former officer, Mr. Mader is all too aware of the interest this case might have for those on either side of the ongoing controversy over the shootings of black men by white officers across the country. "Mr. Mader is white and Mr. Williams was black. But Mr. Mader said the other two officers — who are also white — did the right thing given their situation. In his first story on the incident on May 22, Hamill quoted Heather Poole, Mr. Williams’ half-sister. "She and other family of Mr. Williams, who was African-American, have consulted with both the NAACP and the Black Lives Matter organizations on hiring a civil rights attorney to help them," he wrote. In a follow-up story Sunday, Hamill noted the "peculiar" way the case was being handled. "But a case that has been handled by local law enforcement from the first day on with some peculiar twists — failing to publicly name Mr. Williams for three days, the assignment of an investigator who left for a week-long vacation the next day and tension with Mr. Williams’ family — only got more peculiar," he wrote. Could that be because authorities knew about the racial dynamics they were dealing with? The case isn't going away. Hamill wrote Thursday that the American Civil Liberties Union of West Virginia said that it has filed intent to sue notices with the city of Weirton and the West Virginia State Police. Both denied its Freedom of Information Act request for records related to the killing. "When Democracy Now! host Amy Goodman (9/4/16) asked security guards at the Dakota Access Pipeline construction project why they were using pepper spray and dogs to attack Native American protesters, the guards soon backed off, taking their mace and attack dogs with them," Jim Naureckas reported Thursday for Fairness & Accuracy In Reporting. "It was a dramatic lesson in how journalism can defend the rights of citizens. "The state of North Dakota had a response to this kind of journalism: It issued a warrant for Goodman’s arrest, charging her with criminal trespassing. This is an extraordinary action; Jack McDonald, a lawyer for the North Dakota Newspaper Association and for the Bismarck Tribune, told the Tribune that in 40 years of doing media law in the state he’s never heard of a reporter being charged with trespassing (9/15/16). "So how did reporters respond to one of their own being threatened with arrest for doing her job? Mostly, they ignored it. . . ."
"CBS News paid tribute to late '60 Minutes' reporter Morley Safer on Thursday with some New Orleans jazz from Wynton Marsalis, a letter from the prime minister of his native Canada and a few hearty laughs," David Bauder reported for the Associated Press. Bauder also wrote, "Marsalis recalled conversations he had with Safer, who told him that when he died, he wanted a New Orleans jazz tribute. Marsalis asked him about traditions back home in Canada. 'He said, "We drank a lot," ' Marsalis said, before picking up his horn and, with his band, leading the memorial service's audience to a reception." Safer died May 19 at age 84. Breaking news: In March, this column called attention to the continual mislabeling of hours-old items as "breaking news" on "NBC Nightly News" with Lester Holt, in part citing research by broadcast news critic Mervin Block. Now Block has extended his research on the subject to ABC's "World News Tonight with David Muir," which might be even more egregious than NBC in its false labeling. "Funny how so many stories break during Muir's half-hour broadcast, yet not breaking on CBS's or NBC's 6:30 p.m. newscasts," Block wrote on Tuesday under the headline, "ABC’s David Muir Not Intimidated by Facts." "On September 9, the 45th anniversary of the Attica prison uprising, inmate laborers at 40 prisons in 24 states across the country went on strike (The Root, 9/10/16), The Nation (9/7/16), Guardian (9/9/16), Wired (9/3/16) and Waging Nonviolence (9/7/16) all reported that this may have been the largest prison strike in history," Rohit Chandan reported Thursday for Fairness & Accuracy In Reporting. "But a search of the Nexis news database for the terms 'prison' and 'strike' showed that most national corporate news outlets thought that the potential of history being made on September 9 needed little to no news coverage. . . ."
Lulu Garcia-Navarro, NPR's South America correspondent, will take up the "Weekend Edition Sunday" host mantle in January, NPR announced on Thursday. The move will follow Renee Montagne taking the new role of special correspondent in November and Rachel Martin, the current "Weekend Edition Sunday" host, joining join Steve Inskeep and David Greene hosting NPR's flagship morning drive show, "Morning Edition." "Less than three months after acquiring The Bergen Record, the (Passaic County) Herald News and other assets of North Jersey Media Group, Gannett is trimming the newspapers' headcount dramatically," Benjamin Mullin reported Wednesday for the Poynter Institute. "The Associated Press Thursday condemned a report from a Justice Department Inspector General that found that an FBI agent’s impersonation of an AP editor did not violate its policies," Kelsey Sutton reported Thursday for Politico. " 'The Associated Press is deeply disappointed by the inspector general’s finding, which effectively condone the FBI’s impersonation of an AP journalist in 2007,' a statement from AP, released Thursday, read. 'Such action compromises the ability of a free press to gather the news safely and effectively and raises serious constitutional concerns.' . . . "
"Police forces across the United States are stockpiling massive databases with personal information from millions of Americans who crossed paths with officers but were not charged with a crime," Glenn Smith and Andrew Knapp reported Tuesday for the Post and Courier in Charleston, S.C., with additional reporting by Emma Dumain. "A person can end up in one of these databases by doing nothing more than sitting on a public park bench or chatting with an officer on the street. Once there, these records can linger forever and be used by police agencies to track movements, habits, acquaintances and associations — even a person’s marital and job status, The Post and Courier found in an investigation of police practices around the nation. . . ."
Russ Torres, head of Yahoo Studios, is joining the USA Today Network as vice president of digital video content and strategy, a new position, Joanne Lipman, chief content officer for the Gannett Co. and editor in chief of the network, announced to staff members Tuesday. "In his new role, Russ will oversee video production, programming and strategy for the USA TODAY Network across multiple platforms and audiences. He will work with our editorial teams as well as with product, revenue and other departments to drive best practices throughout the organization. . . ."
In a new series, "Young, Gifted and Black," rollingout.com is saluting "the most talented millennials in their respective fields," starting with those in media. "We consulted industry leaders and peers alike, ultimately crafting a list of 36 who are at the top of the game and five who we think you should watch. Some are on-air reporters and broadcast producers. Others work in print and digital media. . . ."
"Chicago NBC-owned station WMAQ has promoted reporters Katie Kim and Regina Waldroup," Kevin Eck reported Monday for TVSpy. "Kim was named investigative reporter while Waldroup has been named full-time general assignment reporter. . . ."
"Like his political hero Donald Trump, Silicon Valley entrepreneur Andrew Torba doesn’t like being told to shut up — especially not by Internet censors," Hiawatha Bray wrote Wednesday for the Boston Globe. "So he’s launched a new social network for people who feel the same way. . . . On Gab, anything goes. . . . Stuff that could get you kicked off Twitter or Facebook for bullying or harassment is welcome here. . . ."
The issue of free speech on Facebook surfaced this week with the removal and restoration of Nick Ut's iconic photo of a girl burned by napalm running naked in Vietnam during the Vietnam War. Legal commentator Jeffrey Rosen, who discussed the issue at this week's News Leadership Conference in Philadelphia, reported on "The Delete Squad: Google, Twitter, Facebook and the new global battle over the future of free speech" for the New Republic in 2013. The Committee to Protect Journalists Thursday "called on authorities in South Sudan to immediately reopen the Nation Mirror. Security services ordered the independent daily to close yesterday, according to news reports. . . ."
Richard Prince's Journal-isms originates from Washington. It began in print before most of us knew what the internet was, and it would like to be referred to as a "column." Any views expressed in the column are those of the person or organization quoted and not those of any other entity. To be notified of new columns, contact journal-isms-subscribe@yahoogroups.com and tell us who you are.